Our clients often call on us for our strategic and creative approach to communication planning. Last spring, Bryant University invited us to brainstorm ways to increase alumni engagement at a leadership level. A number of processes were put on the table, many combining one-on-one relationship building with personalized print, email, and online media. After taking stock of their internal resources, Bryant decided on an 8-page quarterly print publication to complement personal visits, with a long-term plan to add online components. Working with writer Rick Bader, we named the publication "Engage"—a clear statement of the intended results. 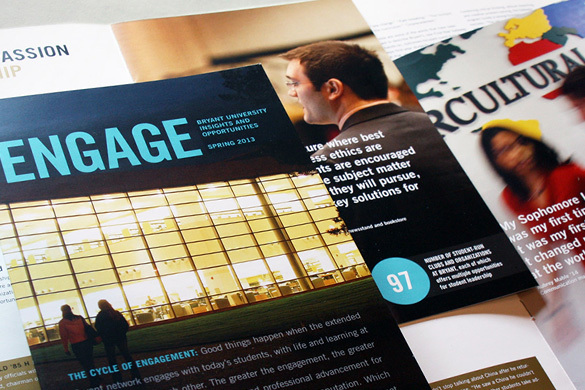 Each issue of "Engage" highlights three current initiatives that are adding value to the student and faculty educational experience at Bryant. Each story includes student and faculty voices, a related statistic, plus a brief sidebar about an alum whose engagement made the initiative possible. Research, as well as our own anecdotal evidence, tells us alumni want to hear about current events that involve students and that bring recognition to their alma mater. Feedback about "Engage" supports this research. The targeted alumni group, informed and inspired by the stories and personal attention from the University, have stepped up their engagement with Bryant. And this continues the cycle that benefits everyone connected to Bryant, from current students to faculty to alumni.